This is a book I’ve been thinking about for a long time – and I kept putting it off because I knew it was going to be tricky. But I’m really pleased I finally got around to it, because it turned out to be a joy to research and write. Of course it covers the 335, but there’s also the stereo 345, the upscale 355, and the hollow 330, and I sorted out and found stories about the dozens of related models introduced during the six decades that followed the 335’s introduction in 1958. 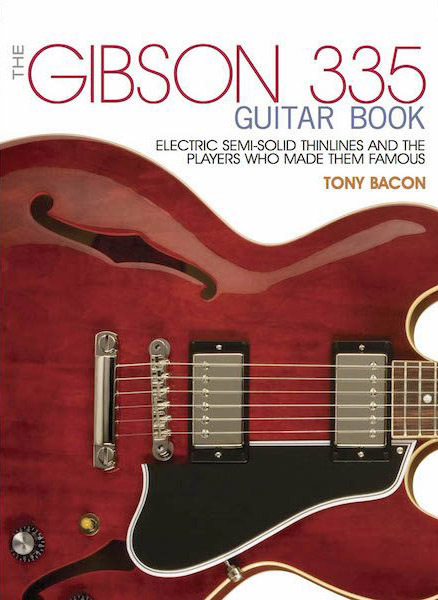 I did my usual thorough round of background chats with plenty of Gibson people, and the book has interviews with and stories about all the major 335-family players, including Eric Clapton, Dave Edmunds, Dave Grohl, Grant Green, Justin Hayward, Jorma Kaukonen, B.B. King, Alex Lifeson, Bill Nelson, Eddie Phillips, Lee Ritenour, Emily Remler, Howard Roberts, Andy Summers, and more. I’ve made an extract from the chat I had for the book with Larry Carlton, available for anyone to read – just so long as you can manage to click on the link here. One online reviewer who gave the book five stars wrote: “Your books keep getting better!” That was so good to hear. And you know what? I tend to agree.